A sidekick to the GOOD PUPPY Children Behavioral & Emotional System, Everything Happens for a Reason is a call to awareness. Reviewing a variety of causes for misbehavior in children, The Little GOOD PUPPY Parenting Guide Book For Growing Good Kids offers solutions to improve communication and cooperation for the benefit of the entire family. Gabriel Tito is a family therapist who, after thirteen years of working with children, ages ranging from two to eighteen, noticed the difficulty in affecting behavior and family dynamics. In order to target this problem, Gabriel became the main collaborator in the development of the GOOD PUPPY Children Behavioral & Emotional System. Designed to improve communication and provide children the structure they seek to feel secure and develop healthy self-esteem, the system works on consistency and incentives. Based out of Fort Lauderdale, Florida, Gabriel works with both children and parents through child therapy, family therapy, drums therapy, GOOD PUPPY parenting classes, conferences and presentations. Teaching and helping people apply the GOOD PUPPY System has allowed Gabriel to affect real and positive change in child behavior and family dynamics in record time. Sustaining the system has proven easy for parents that can be consistent with its application. I work with children, ages two to eighteen, who suffer from fears, sadness, hopelessness, worries or anxieties, children that present hyperactive or inattentive behaviors, or children that are being defiant or presenting disruptive behaviors. I provide a safe environment for children to express themselves verbally, through play, music and art. I provide Systemic Family Therapy, helping family members make changes in order to have a healthy functioning relationship. Assisting families to observe dynamics from a different perspective, encouraging them to support each other and promoting positive changes for their well being. I provide family sessions using drums as a tool of communication to work through family dynamics. Drumming involves listening to each other to work together and create harmony through rhythm. Drums help people express themselves while having fun and connecting to each other through the sound's vibrations. Drumming allows children a quick understanding, through experience, of the importance of a leader and following rules and directions. In order to apply the system at home, I offer three family sessions designed to provide instruction and guidance and get the entire family on the same page. Each session has a focus that should quickly implement the system, get the family playing and parents the confidence to use their creativity to make the most of the tools for their children's highest benefit. The first session includes an introduction to the system to both parents and children and its implementation. Starting with basic tools that allow for changes in the family dynamics designed to benefit all and improve communication. The second session is focused on assessing the system's effect on the child and family in order to correct its use, tailor incentives based on child's personality and response, and include new tools to better serve the child's needs. The third session is focused on assessing the latest behavioral changes to implement the most effective incentives and head parents in the right direction for a long term system of behavioral success. Working with schools, I offer presentations for both teachers and parents, to help establish a uniform and seamless behavioral system that encompasses emotional understanding. An introduction to the system, including behavioral implementation at school, management and the use of tools to improve communication of emotions. An introduction to the system, including behavioral implementation at home, management and the use of tools to improve communication of emotions. 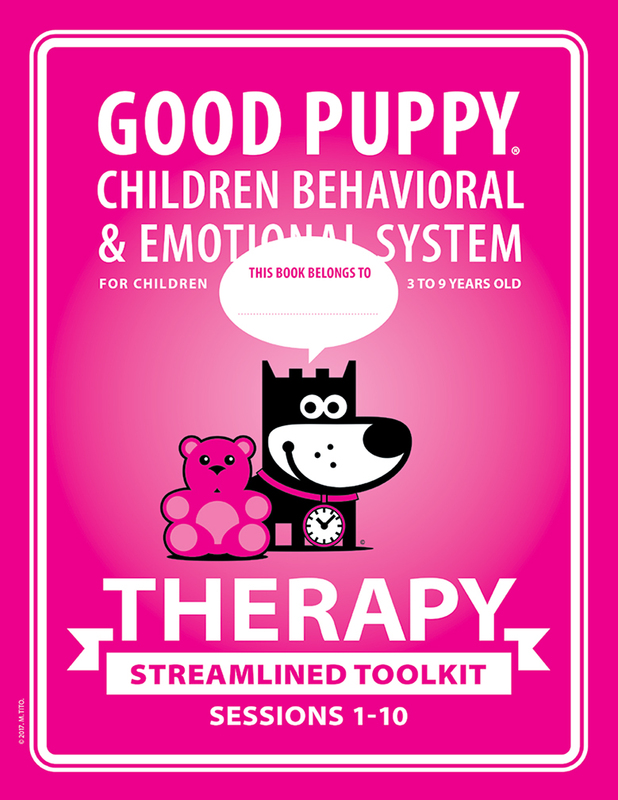 I offer one-on-one, or group presentations to therapists looking to include the GOOD PUPPY System in their practice. My presentation includes an introduction of the tools, their implementation and how to combine them in order to make the most of the GOOD PUPPY system for your highest level of success. Customized to therapist's requirements for home, school or therapy implementation.